Special Coordinator of the Joint Mission of the OPCW and the UN Sigrid Kaag (second left) inspecting preparations for the elemination of chemical weapons at the Syrian Port of Latakia in December 2013. Syria has, as of 19 April, removed or destroyed in-country approximately 80 per cent of its chemical weapons material, the head of the Joint Mission of the Organization for the Prohibition of Chemical Weapons and the United Nations announced today. 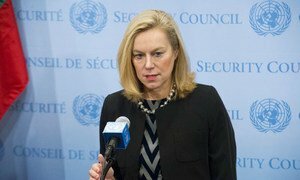 Sigrid Kaag, Special Coordinator of the OPCW-UN Joint Mission, said in a statement that further engagement is expected to sustain momentum and to complete removal operations during the next days. This will contribute to meeting the deadlines set by the OPCW Executive Council, including the 30 June 2014 target date for completing the destruction of Syria's entire chemical weapons programme. “The renewed pace in movements is positive and necessary to ensure progress towards a tight deadline,” said Ms. Kaag. The statement also noted that Syria has further completed destruction of empty mustard gas containers, and made progress closing chemical weapons production and storage sites. The Joint Mission of the Organization for the Prohibition of Chemical Weapons (OPCW) and the United Nations said today that over half of Syria’s chemical weapons material has been removed or destroyed.